Has AP Become 'Actually Pravda' For Hillary's Campaign? Until recently, those of us who follow the routine instances of journalistic malfeasance committed at the Associated Press only thought that its writers are so enamored of the idea of a Hillary Clinton presidency that they simply accept her campaign's spin as the gospel truth and willingly dress it up as "objective news." That's obviously bad enough. But Monday night, that all changed for the worse — and in the following days, it has became even more obvious. It is now eminently reasonable to believe that the wire service has been proactively involved in real time in advancing and even planning the Clinton campaign's strategies and tactics — essentially serving her as a stenographer, like the Soviet Union's old Pravda. Monday evening, AP, without any specific electoral result triggering such news, declared that "Hillary Clinton has commitments from the number of delegates needed to become the Democratic Party's presumptive nominee for president, and will be first woman to top the ticket of a major U.S. political party." Note the use of the word "will." As the word is used in the language formerly known as English — which has now apparently been jettisoned in favor of Clintonian Newspeak — it's supposed to mean that there is no doubt whatsoever that Mrs. Clinton will be the nominee. The key to the AP's declaration is its contention, as explained in coverage at Politico, that it obtained assurance from 571 Democratic Party superdelegates that they, in AP spokesman Paul Colford's words, "told us unquivocally that they intend to vote for Clinton at the convention." AP then (incredibly) assumed that there's no way a single one of them could possibly change his or her mind between now and late July. It's not as if there aren't plausible reasons for superdelegates to reconsider. A possible indictment of Mrs. Clinton over her use of private email accounts and a home-brew private server is just one among several items which might legitimately cause a superdelegate to shift their support to someone else. If, as polling suggests, 71 percent of Democrats would still vote for her even if indicted, that still means almost 30 percent wouldn't. This would dictate the need for her to win about two-thirds of all moderates to defeat Donald Trump if he garners the support of the vast majority of Republican and conservative voters (by no means assured, of course). A superdelegate who wants his team to win can't simply blow off a problem like that. AP's "Hillary's won" meme arrived just before Tuesday's final batch of primaries, including California, where Mrs. Clinton and Bernie Sanders were in a virtual dead heat in preelection polls. It turns out to have been an extraordinary godsend for the frontrunner, who ended up taking the Golden State by 13 points, thus putting defiant Sanders supporters in a far less tenable position at the convention. It turns out to have been quite "clever" for AP, at Team Clinton's likely urging, to believe that Sanders' relatively young supporters would be less likely to turn out if the newsfeeds on their smartphones and other devices misleadingly told them that Mrs. Clinton had sewn things up. Note that I wrote "At Team Clinton's likely urging"? Really? There is evidence that the AP's Monday evening timing was no accident, and that it was coordinated with Clinton campaign. How odd it is that the full URL for a graphic on an "HRC.ONL" web site (as if we don't know what "HRC" stands for) contains "060416" and a reference to "secret win." 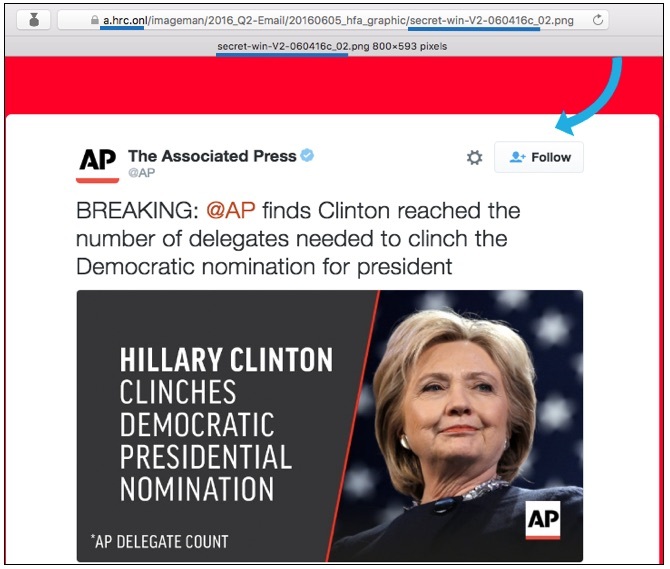 One doesn't have to be paranoid to believe that the presence of a graphic with the AP logo referring to an "AP delegate count" at an "HRC" web site two or more days before the AP's Monday evening "Hillary's in" declaration indicates AP-Clinton campaign coordination. The existence of coordination, joint strategies, and joint tactics would cause other odd things which have occurred during AP's coverage of the Democratic primaries to be more plausible. It would explain how the wire service's reporters were consistently able to deliver lengthy, comprehensive dispatches mere moments after a state's primary or caucus winners were determined, and how those dispatches typically favored Clinton's spin over Sanders' (if the Sanders spin was even present). AP's quick releases make more sense if its reporters planned and received their pull quotes and talking points from the Clinton camp (but not Team Sanders) well ahead of time. Clinton-AP coordination would also explain how the wire service, in the relatively few moments during which it hasn't completely ignored her scandals, has consistently sung Team Clinton's "Hillary won't be indicted, because she didn't do anything really bad" tune with little if any reported dissent, despite the fact that other news organizations left and right have found plenty of knowledgeable people who believe that Mrs. Clinton intentionally and unintentionally (but while jeopardizing national security) committed crimes deserving of vigorous prosecution. Tuesday on the podcast Recode Replay, Podesta acknowledged that it was “a mistake” to combine work and personal emails. A question for Associated Press: Couldn't "some people," depending on future developments, include certain superdelegates who told you "unquivocally that they intend to vote for Clinton at the convention"? The answer is obviously "yes," which makes the answer to the next logical question automatic: "Doesn't that render your Monday evening declaration that 'it's over' bogus, and didn't you know that when you did it?" Of course it does, and of course they did. The Associated Press is warning its reporters to stay vigilant after several received harassing messages from supporters of Democratic presidential candidate Bernie Sanders. Danny Spriggs, the AP's vice president for global security, said some reporters have received angry emails, social media messages and phone calls after the AP declared Hillary Clinton the presumptive Democratic presidential nominee. 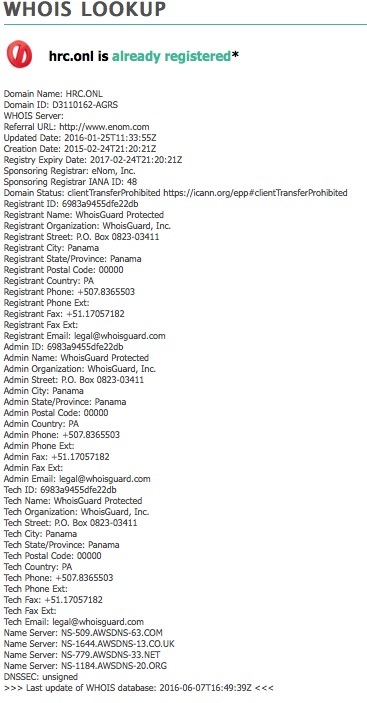 "We have not received any specific security threats," Spriggs said in an email to employees, according to Poynter. "It is always good to practice situational awareness around AP bureaus and offices." Well, Mr. Spriggs, if you don't have any "specific threats," why did your employer make sure we knew that it clearly considers many Sanders supporters presumptively dangerous? Where was the leaked memo warning reporters to "practice situational awareness" in Ferguson in 2014, or in Baltimore during that city's riots in 2015?